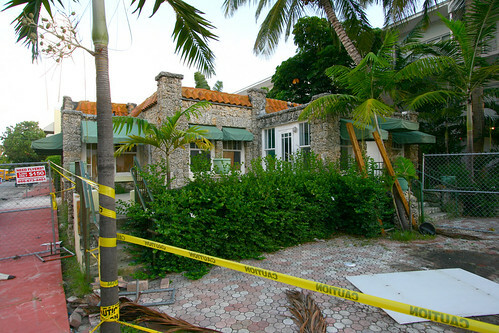 Coral house on Collins Ave., getting torn down as we speak. Yep. Around the corner there’s another coral house which survived, and is about to open as (i think) a restaurant. This one for some reason didn’t fare too well — a couple of businesses gave it a go over the years, but it just never worked out. Sad. So sad! Once again lets applaud Miami for the dedication they have to preserving our past. Good job Miami! Demolition in progress. Strictly speaking it’s Miami Beach, but I echo your sentiments. yay history! Miami is now like Las Vegas! The location is horrible. That’s why no business can operate there. The city should have moved the home years ago to Lummus park or south point or anywhere else and let this scumbag build a new building which will stay just as empty as this beautiful thing. The other coral home is on Washington and 10th street, across from the Wolfsonian (Wash. Storage). They appear to have completed renovations on it and have a sign looking for employees for the restaurant. There’s also a wooden home on Meridian and 3rd which the city claims wants preserved as well and that one has been disintegrating for years. It’s supposedly the oldest structure on the Beach. I am sure everyone involved is hoping a hurricane just takes it. There is no real desire for preservation among city leaders. There was for a few years when the only people who wanted to develop properties were interested in using art deco as a selling point, but when developers want something else the city has no desire to stop actually stop them. They get more tax dollars this way, so why would they care? City policy in the 60s and 70s actually CREATED the historical wasteland south of fifth. The city is useless. The only way to stop the slaughter is to boycott new business and humiliate the owners into thinking old structures are more valuable to them as advertising. Did someone say city leaders??? Are there any in Dade??? This really stinks. Before moving to Miami, the coral house was one of the landmarks or sights of Miami Beach that always made me smile, and served to let me know that I was in the heart of South Beach. Great sights and scenery were two of the reasons my wife and I chose to relocate from the Midwest with our young son. I hope that, now that we’ve made the commitment to move here, all the charm of the city isn’t thrown under the bus in the name of ‘progress’. Oh, Todd. You are so screwed. The city thrives on throwing its charm under the bus. Heck, for a buck it’ll throw it under anyone looking for some horizontal action. I have a 1926 coral home in Broward that we are restoring on our own and we would love to have some of the coral and the canopy awnings. Anyone know if this is already gone and who owns it?